I always want to have a long lasting battery ultrabook to install Mojave on. I was looking at Dell XPS 13 but its design is not very good with the camera and other problems. HP Spectre x360 is a nice design but the wifi module is soldered on board. The Envy 13″ is the best one in the bunch for MacOS Mojave. I would not use any other macOS besides Mojave, it’s the best one so far. If you can’t get it done with macOS Mojave, you don’t do it correctly, it’s much more refined and given than older macOS’s. I wanted the 8th generation because of the 4 cores which is almost 1.5 times faster than this 7th generation i7-7500u, but the price is too high. I picked up this one on Craigslist for $400. I’ve just ordered the 500GB NVME WD Black for $104 and DW1560 for $29. So, the perfect MacBook Pro 14,2 is less than $600 that last 4-5 hours with Mojave and 8-9 hours on Windows 10. 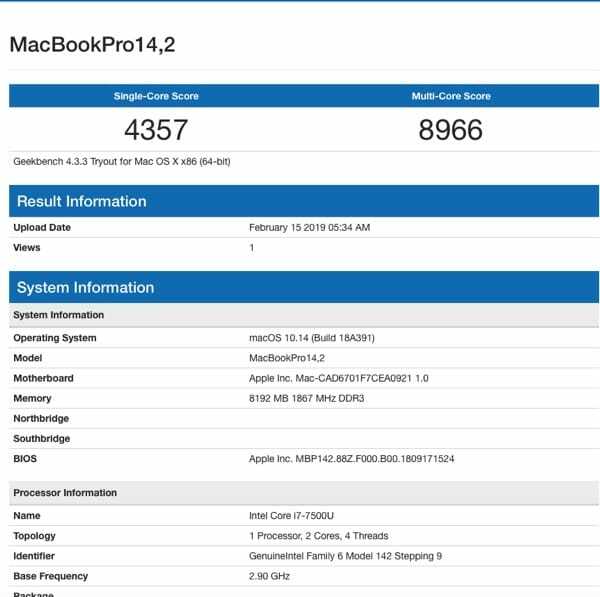 The bench mark is the same as the real MacBookPro 14,2. BTW, this is the first try, there will be on going testing and confirming. 250GB hard drive is hardly enough for dual boot Windows and Mac. You need at least 500GB, I don’t use Windows at all, so I’ll partition 200GB for Windows and 300GB for Mojave. All new HP laptops will have kernel panic if using Clover to boot UEFI, at least a fix was found. I’ll have more videos and info when I have time to write them. Watch the videos and ask questions if you have any problems. 1. Clover 4558 – Lilu.kext (1.3.3) – AppleALC.kext (1.3.1) – Whatevergreen.kext (1.2.3) – USBInjectAll.kext (0.6.5) – Fakesmc.kext (6.25-332-gf3a8525c.1758) – ACPIBatteryManager.kext (1.81.4) – AHCIPortInjector.kext – BrcmFirmwareRepo.kext (2.2.7) – BrcmPatchRAM2.kext (2.2.7) – CodecCommander.kext (2.6.2) – FakePCIID_Broadcom_WiFi.kext (1.3.9) – FakePCIID_Intel_HD_Graphics.kext (1.3.9) – FakePCIID.kext (1.3.9) – SSDT-AUIC-ALL.aml – SSDT-USBX.aml – SSDT-PNLF.aml – SSDT-PluginType1.aml – PreLoader.efi. 2. For the keys F2 & F3 to work with backlight slider – the Fakesmc.kext version is important for some reasons, I’m still trying to find out why. I’ve been playing with the laptop for over a week now. Ordered the WD 500GB WDS500G2X0C from Amazon for $104, the 256GB is too small for dual booting Windows 10 & Mojave. It’s really plug and play. Hardware – needed to make this a perfect macbook Pro14,2. 1. DW1560 BCM94352Z – make sure it has 2 notches – Tape the 2 right pins on the 4 pins tab for it to work without a hitch on both Windows 10 and Mojave. You can buy from Ebay cheaper but you have to wait for months. 2. 500GB NVMe SSD m.2 connector M is a must for dual boot – the cheaper one will be slower – Crucial NVMe 500GB is $25 less than WD. 3. NOVOO USB-C to HDMI hub that works and inexpensive. Let’s start to get this Kaby Lake working on the HP – I believe HP has the same components for similar configuration on different models. In order to get Mojave to work on Intel Laptop, we need a few important components – Sound is important (look for Realtek – ALC295) – Ethernet if any -Realtek – Trackpad and TouchScreen (Synaptics or Elan). The current BIOS is F22, the newest one is F27 but I don’t want to update since it’s working well. Since I don’t really need the original Windows 10 with Junk software in it, I install the latest Windows 10 using Media Creation USB Boot Drive. The important thing is we have to prepare the SSD correctly or our EFI folder will only be set at 100MB which is not enough to install Clover or any other boot loaders. So instead of letting the Windows installer to create the EFI folder automatically, we can set the size ourselves using “diskpart” command. 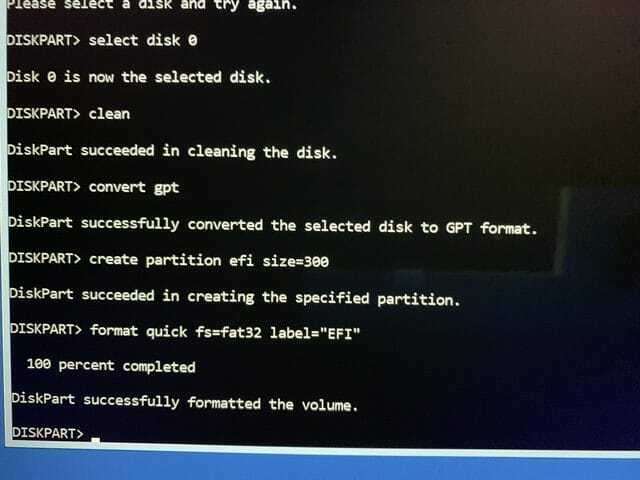 In order to use diskpart, we need to boot with Windows 10 USB installer (hit F9 then select UEFI USB installer) – select system repair and not installation – then select command prompt, from here we can create EFI folder and MSR for Windows installer to install. create partition efi=300 !!! you can change it from 300MB to any size.